Has anyone found a way to see the posted images? Creating an account at imageshack does not help! I could really use the original pics too! I have a 2012 leaf and a 3rd party camera that replaces the number plate light. I'm pretty sure I could work this out with a multi-meter and the text but the images would really help. s that are not extended through the tailgate harness. Four are in a square arrangement, and the 5th next to the square. The 4 in a square are Red and white (camera power), and black + Black (video signal). The black wire beside the square is the video trigger for the NAV to backup (ground it). If you get the video signal polarity backwards, it won't give a picture on the NAV. Tried it both ways, and used an old VCR for test video so as not to risk damage to the new camera. 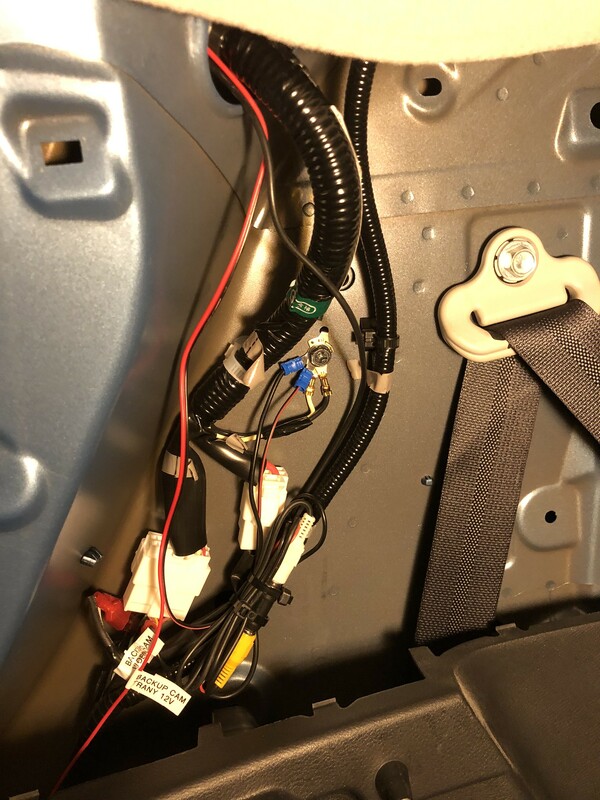 This picture shows the black and black video signal wires I used in the body harness side behind the right rear quarter panel. The red and white wires are right below it in the square arrangement. They are factory camera power, unused for my aftermarket DVR camera. I installed $20 backup camera today to my 2013 SL but took much longer than I expected because above description wasn't accurate or my car had no 12v power from red and white wires. I spent several hours trying to figure out and rule out power or camera issues. Long story short, nothing was wrong with camera and had to find another power source. I only used red/purple line for 12V. Ran the wire from right to left. I used ground terminal on the left side so that I don't have to run black (ground) wire from right to left. I decided to mount camera to door handle. Ran video and power wires from left side of trunk to hatch back door. It wasn't easy to thread wires through rubber connector. Taking the hatch back door handle apart was a challenge. I had to drill out screws because they were totally frozen and heads were stripped. Once you remove the hatch back opener switch from door handle, you can mount camera and thread wires behind/inside hatchback door clean. JohnGalt69 wrote: I just finished installing the factory backup camera in my 2013 SL. 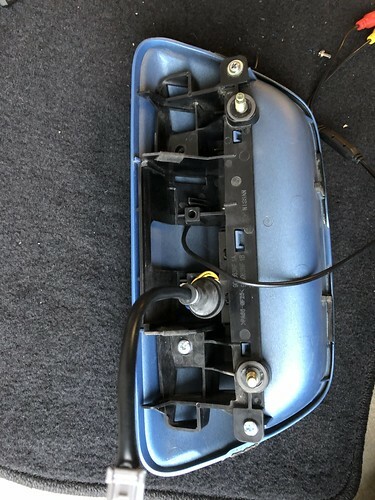 My car had 13 wires on the body side of the B18 connector (meaning it had the correct body harness for the camera), and it had the correct hatch harness (with the wiring and connector for the camera), so I just bought the following parts, installed them and the camera just worked. It took maybe 30 minutes to install. Based on your post, I bought all of these parts(except for screws) for my 2013 SL. Is the body to hatch harness the last harness before the camera? I plan on installing this weekend. any reason i cant see the pictures? billjenll2 wrote: any reason i cant see the pictures? They've been deleted or expired on another server. I wish I could see them too after spending yesterday trying to get one to work. I'm not sure if they would clear things up, but you know what they say about them; they're worth a thousand words. 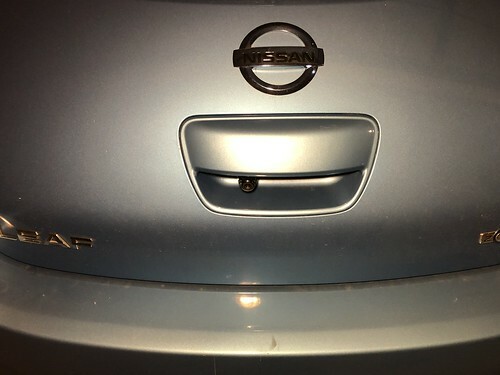 OK, I finally got my camera installed in my 2013 SV and there are several issues in this How To that need to be addressed before anyone with this particular car attempts this mod. First of all, according to the factory service manual, the 2013 SV without Bose does not have have an M84 connector to the AV control unit. It is an M96, which is just a rose by another name but it's very important if you're trying to find a proper wiring diagram! As for the pin #'s we are discussing, they are 40 for R Camera Comp, 58 (definitely not 56!) for Reverse Camera Signal, and 60 for R Camera Shield. The positions listed earlier are correct though, upper left, lower left and third from the bottom if viewed from above. The next thing that anyone attempting this should note is that your car will most likely not have any wires in these positions. Mine did not, but like a fool I assumed that the furthest left, etc. were the ones I was looking for. Don't be like me, look at your wiring diagram and pay attention to the pin #'s. We had to add pins to make this work. 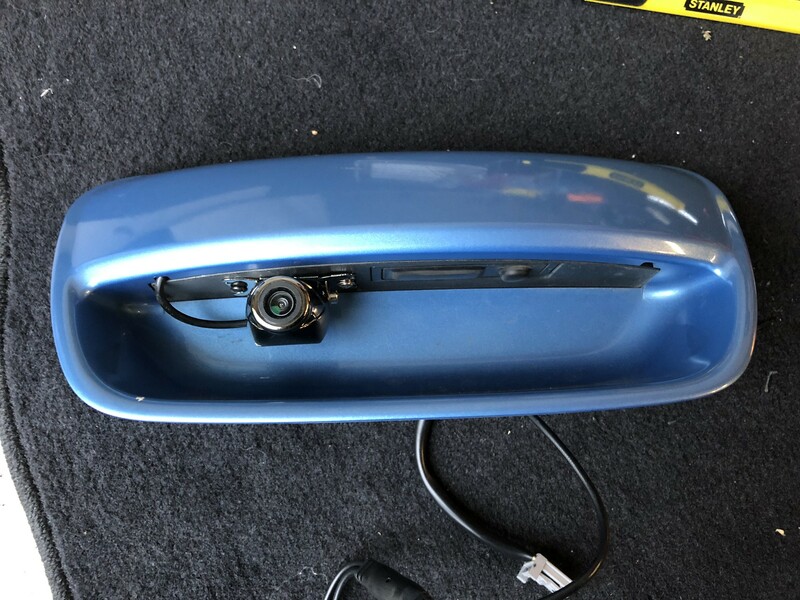 I used a BOYO VTL17IR HD camera because it fits behind the license plate and I have heard good things about this brand. It works fine and has a very wide angle, although there are issues with mounting it so low; like the lines that are superimposed on the screen that seem to point over the top of anything in your camera's view! It does come with another mount and I may try to mount it in the latch at a later time. Now for the weird part: After banging our heads against the wall on our first attempt, my friend brought over a monitor so we could check the feed from the camera. We took our power from the backup lights, and when powered up the camera worked fine. That's when we figured out the pins were missing and made the appropriate connections to the M96 connector. That gave us the blank screen with the lines drawn on the screen, but nothing else. We checked and re-checked connections and the wiring diagram. We tried reversing the wires on the camera feed. Nothing. By chance, my friend dropped the R Camera Comp (onent) wire from the connection and the screen lit up with an image. We still don't get it, but just the #60 pin, R Camera Shield is giving us the video feed. Hook up the #40 R Camera Comp and it goes away. Doesn't make sense, it's contrary to everything I read, but it works. Tried an aftermarket camera named Auto Water-proof Camera with model CCD-304HD. Worked on C -pillar on the left side on B18 connector. Grounded pin 11 black wire to activate the monitor for camera mode when on reverse and connected a female video RCA with wire input, black wire on pin 18 to positive which is video signal and the grey wire on pin 17 to the negative input or shield. Originally connected the camera power input red and black wires to red wire on pin 13 and white wire on pin 12 respectively but since I cannot get a video image when on reverse, opened up the left tail lamp in order to connect the red camera input power wire to the bulb that goes to the revers light bulb positive. I tried to get this through I believe B80 connector behind the lower left trunk trim. Btw I use solder less and stripless wire connectors and since we ran out, I just connected the black wire of the camera input power to the same screw where I wired the black wire on B18 pin11 to ground it. I still could not get a video signal. 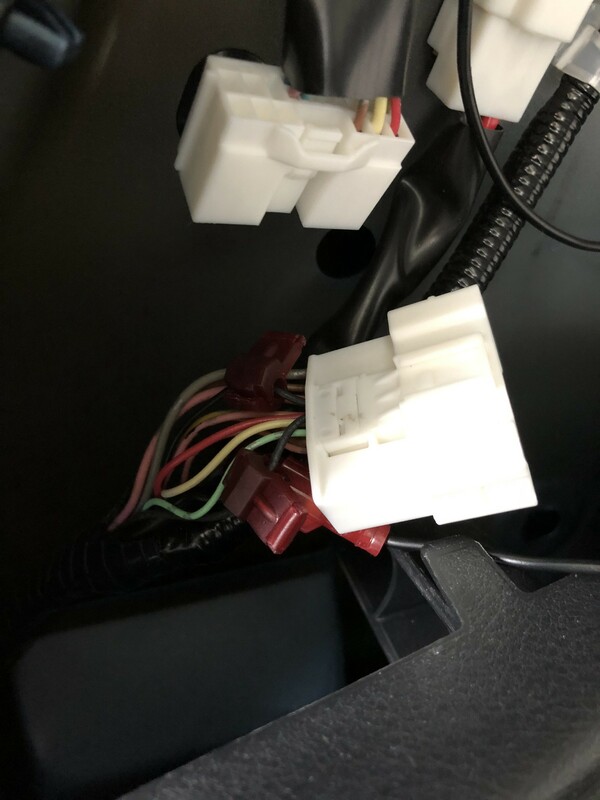 My guess is I do not have a complete circuit as the wire going to the reverse light bulb is not connected to this grounding screw attached to the wall on the C-pillar. Also my camera I believe requires 12V and the wire on B18 pin13 only has 6V as what the OEM camera needs. BTW, I have a 2011 Nissan Leaf X model from japan. Anyway can anyone help me solve my problem why I do not see video image when I go on reverse but I do see a black image with reverse guide lines. 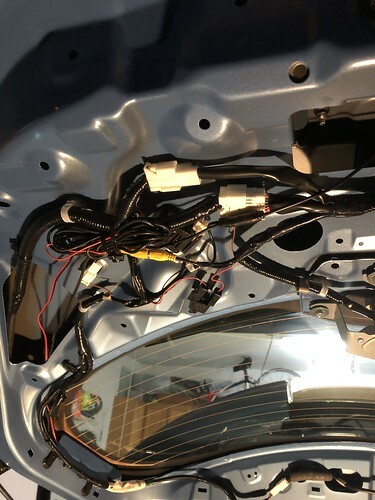 Am I right in saying that Its because I should really connect my camera black input wire or negative to the reverse light black wire or negative and not the ground screw I connected the wire to signal my telematics c/u that I have reversing camera. I can't help with the 2011 model wiring, especially from a foreign market. You really need to find the wiring diagram from the service manual for your car. The good news is you got the blank screen with the guide lines when in reverse, so you are halfway there. You need to confirm you have power to the camera with a test light or multi meter if you have one. The ground should be fine. A ground is a ground! After my ordeal, I would consider just hooking up the video shield wire and see if you get video. As I said in my post, makes no sense but that's what worked for me!